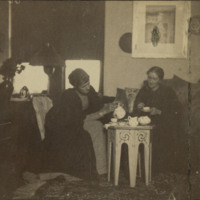 Photograph of two unidentified students sitting and having tea in a dorm room circa 1898. 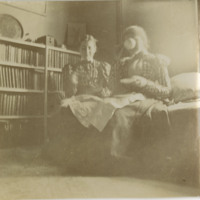 Photograph of two students sitting and having tea in a dorm room before 1900. These students are identified as Emma Bailey (Speer) and Abby Brayton (Durfee), both class of 1894. 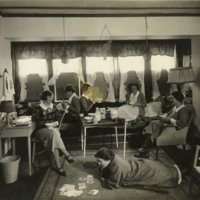 Photograph of seven unidentified students in a dorm room circa 1900-1929. One is standing while the rest are standing and they appear to be having tea. 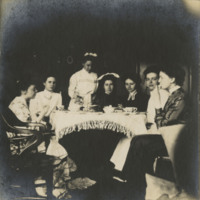 Inscription on back reads 'Adola Greely Album c 1904'. 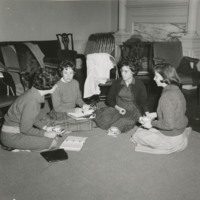 Photograph of four unidentified students, all seated and holding tea cups. One student has notes on the floor and a purse is visible as well as some folding chairs and a couch along with a chair in the background.